Article by Ink Stains © 8 February 2019. Posted in Guest Blogs (Ink Stains). What Your Article Should Look Like? The main purpose of the article is to inform, engage and create interest for the reader. Assume that your reader is also young and has the same interests as you. Pick your topic, make a plan and organise your ideas into paragraphs. Your article should have a heading or headline which makes the subject clear and also catches the reader’s attention. Sometimes it is useful to pick this last so that it reflects what you have written. Make it personal – give examples, let us know your views, ask questions and give advice. Divide the article into paragraphs to help the reader follow the argument. Use transitions to make your article easier to read. Signify paragraphs by skipping a line, do not indent paragraphs. End with an overall comment or conclusion. Read over your work and do a spell check before submitting. If you would like to write a poem, please have a minimum of 20 lines. The poem must be on internet safety. You can also email it to: internetsafety@pdst.ie. Please use ‘Writing Competition Entry’ in the Subject Line. Don’t forget to tell us what school you are in and what year you are in. • Closing date for entries is 5pm on Monday 4th March 2019. • There is a prize to attend a secret gig in an exclusive Dublin venue for approx. 8 participants and 2 accompanying teachers per winning school for the following competitions: The Arts Award- Poster Competition, Writing Competition, Music Competition, The Campaign Award- Best Overall Campaign, Most Effective Anti-Bullying Campaign, The Techwise Award- Social Media, Best Use of Technology, Best Video. The SID Awards gig will take place in Dublin on a school day. Date and Venue will be confirmed in February. • There is also a category exclusively for Safer Internet Day Ambassadors – this leadership award looks at both their commitment to the programme and the Safer Internet Day campaign they led in their school. Competition entry varies so please check the competition guidelines carefully. You can submit your entry via the email address provided: internetsafety@pdst.ie, via the Google Form. You can also send additional videos or pictures to support your entry to the email address: internetsafety@pdst.ie carefully stating the competition and name of your school. Competition is open to Secondary schools and students of Republic of Ireland only. Competition is open to second-level schools/institutions and individuals in the case of the SID Ambassador Leadership Award. If for any reason the winner cannot be contacted within 1 week of being announced. Another winner will be selected by the judging panel. • This competition is open from 5.00pm on Wednesday 16th January 2019. • The promoter will have no responsibility for any additional costs associated with the prize (including travel to and from the venue). Any prize is as stated in any messaging or promotions advertising such competition. No cash or other alternative will be offered and prizes are non-transferable. The promoter retains the right to substitute the prize with another prize of similar value in the event the original prize offered is not available. • Employees or agents of the PDST, any associated group companies, prize sponsor and or agencies associated with this competition and their immediate families are ineligible to enter. Any such entries will be invalid. • Entry to the competition is free. No purchase is necessary. • A valid entry must be submitted via the relevant channels as stated on the competition guidelines of each category. • An independent panel of judges will will pick the winning entry in each competition from valid entries received. The decision is final and no correspondence will be entered into. • The promoter is excluded from liability for any loss, damage or injury which might occur to the winner arising from his or her acceptance of the prize. • The winner may be required to participate in unpaid promotional related publicity undertaken by the promoter or its associated companies. • By entering this competition you are agreeing that any submissions made become the property of Webwise. Competition entries may be used for further promotional activities, including but not limited to: online advertising, promotion on social media and via webwise.ie’s websites. • Entry to this promotion shall be deemed full and unconditional acceptance of the terms & conditions. • The promoter reserves the right to amend these terms and conditions. • These terms and conditions shall be governed by the laws of Ireland and subject to the jurisdiction of the Irish Courts. • The promoter shall not be liable for any failure to stage the competition on the date provided in these terms and conditions as a result of circumstances outside the promoter’s control including, but not limited to, acts of God, war, riots, explosion, abnormal weather conditions, fire, flood, Government action, strikes, lockouts, delay by third parties, accidents and shortages of materials, labour or facilities. • No responsibility is taken for entries that are lost, delayed, misdirected or incomplete or cannot be delivered or entered for any technical or other reason. Proof of delivery of the entry is not proof of receipt. • Prize is subject to availability. All entries must be new work – created for Safer Internet Day 2019. Right to cancel the Competition: We have the right to cancel the Competition or change the Prizes or Competition Rules without notice and without liability to any entrant. In the event we do not receive enough Entries by the Closing Date or if we are prevented from awarding any prize(s) or continuing with the Competition as contemplated herein for any reason, we shall have the right to modify, suspend, or terminate the Competition. Follow Ink online, on Twitter and on Facebook. 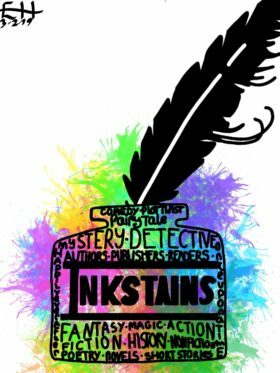 Ink Stains is our blog dedicated to younger writers. Here we post competitions, information on events and tips. The best advice? Keep reading - everything you can lay your hands on, and keep writing. Write for yourself to find your voice. If you'd like to contribute to this blog drop vanessa@writing.ie an email. Our superb Ink Stains illustration is by Emily Hearne , age 12, who is a 6th Class Student at Gaelscoil Uí Drisceoil, Cork, thank you Emily!